Keep barns clean and adjust turnout time to minimize allergic symptoms. Dust, mold, pollen and similar particles can all trigger an allergic reaction in your horse. Symptoms of an airborne allergy are usually limited to either skin or respiratory issues. It's possible, but rare, for these allergens to produce both symptoms at once, according to Equus Magazine. Possible skin issues include hives and itching, while respiratory problems result in a runny nose, coughing and potential heaving. Respiratory symptoms are sometimes mistaken for the side effects of an infection, according to Horse Channel. The difference is infections also produce fevers, and any oral or nasal discharge is yellow or green, rather than clear. "Minimize exposure to allergens by cleaning your barn and checking feed for mold." The primary way to treat an airborne allergy is to minimize exposure to the allergen in question. Keep the barn area clean and dry, and make sure feed and bedding are free of mold. If you can't pinpoint the allergen on your own – that is, if you're not sure whether your horse is allergic to mold, dust or some other substance – have a veterinarian perform a skin test. These can be a bit pricey, ranging from $300 to $400 according to Equus Magazine, but they let you know exactly what to look out for. Additionally, Finish Line's Air Power can soothe minor coughs and irritation. A single dose contains a variety of natural ingredients, including lemon juice, apple cider vinegar, honey and eucalyptus to comfort the throat and loosen phlegm. However, if your horse has recurrent airway obstruction – a case of heaves that doesn't go away – you'll need to consult your veterinarian for prescription medications like oral steroids. Bug bites are the most prevalent allergy among horses. Common culprits include mosquitoes, horseflies, fleas, deer flies and biting midges. The latter insects, which are also known as Culicoides, are responsible for the worst bug-related horse allergy, sweet itch. Insect allergies are triggered when the bug's saliva comes into contact with the horse's skin and blood. Itching is the primary symptom, and a horse may become so uncomfortable that it scratches itself to the point of causing hair loss and skin damage. A secondary symptom of insect allergies are hives, which usually appear on the neck, shoulders, sides and chest. To treat an insect allergy, bathe your horse with Finish Line's Herbal Shampoo to clean, moisturize and promote healthy skin without irritating the affected area. Follow with a topical ointment to heal the skin and provide itch relief. Blanket your horse with insect-repelling covers or spray. In addition, alter turnout to a time of day when the bugs that trigger your horse's allergy are least active. For example, according to Equus Magazine, biting midges are more frequent during the day, so you should only let your horse out at dawn and dusk. 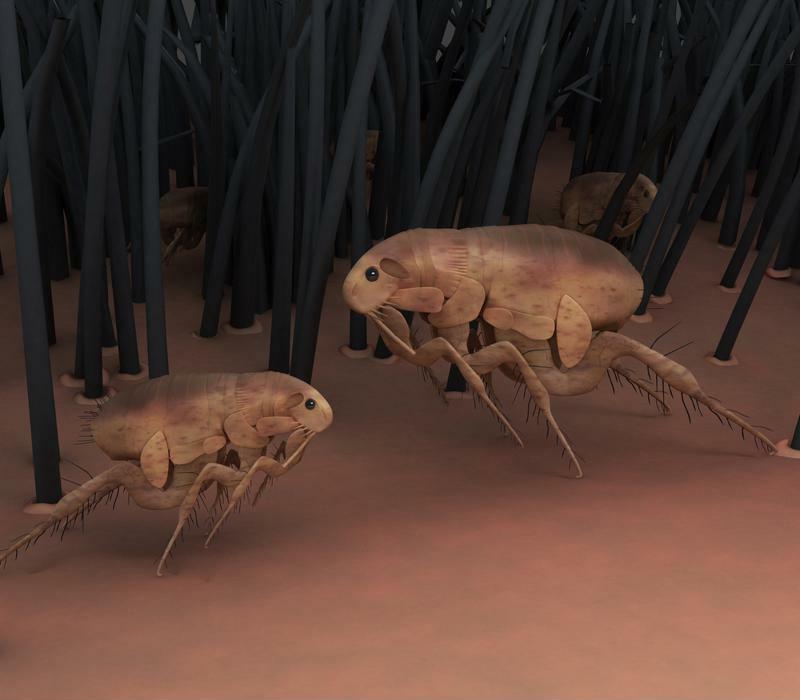 Flea bites often cause allergic reactions. This broad category encompasses anything that causes an allergic reaction when it touches a horse's skin. Most contact allergies are produced by grooming products, fly sprays, wool products (including items with lanolin, the oil in sheep's wool) and rubber objects. As with airborne allergens, removing the trigger will alleviate symptoms. If you discover your horse has a contact allergy, use process of elimination or a skin test to figure out the cause. In the future, read ingredient and product lists thoroughly so you don't accidentally reintroduce your horse to the allergen. If your animal's skin is particularly sensitive, switch to products that are gentle on the skin like Finish Line's Herbal Shampoo or Blaster Horse Spray. Food allergies are rare in horses, but such instances are nevertheless a hassle to deal with. Pinpointing the issue can be a struggle. The allergy may be caused by a specific type of food or an additive mixed into pelleted feed. The main symptoms of this type of allergy are hives or rashes that cover the body, which are sometimes but not always accompanied by itching. Removing the allergen from the horse's diet is the only effective treatment. Medical allergies are incredibly rare but potentially fatal and must be addressed immediately. Mild symptoms include swelling at the injection site and hives across the body. Severe cases result in anaphylaxis, an immediate reaction where the horse's entire system goes into shock. Anaphylaxis results in death if the horse isn't cared for immediately. Always consult a veterinarian if you suspect your horse has a medical allergy.